Drop by Bruin Plaza from 10 a.m.-2 p.m. on Nov. 21 for UCLA’s Great American Smokeout activities, where Bruins can pick up a free cookie and learn more about the campus’ tobacco-free policy. UCLA’s Tobacco-Free Task Force will host the table in Bruin Plaza, in part to celebrate UCLA’s first six months as a tobacco-free campus. They’ll offer freebies like t-shirts, stress balls, cookies and coffee. Bruins are invited to learn more about resources to help quit or cut back, get details about how the policy works, or visit to show their support for the policy and get a cookie. A survey of cigarette butts on campus indicates the policy is working: Students at the Institute of the Environment and Sustainability conducted the study when UCLA’s policy took effect and found that the number of butts littering sample sites on campus decreased from an average of 600 to 160. 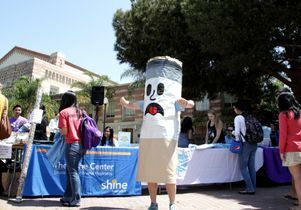 In Bruin Plaza on Thursday, volunteers will also hand out 25 mini quit-kits with distractions like gum and lollipops, and spread the word about resources like 1-800-No-Butts, California's free helpline for tobacco users who want to quit. Elsewhere on campus any time of the year, campus tobacco users can also pick up free nicotine-replacement therapy starter kits containing a two-week supply of nicotine patches. Students can claim theirs at the Ashe Student Health Center. Staff and faculty can get kits from the Occupational Health Facility, room 67-120 in the Center for Health Sciences. UCLA is one of more than 800 tobacco-free campuses nationwide, and in January, all 10 UC campuses will go tobacco-free as part of former UC President Mark Yudof’s call to ban the use of cigarettes, cigars, pipes, chewing tobacco and electronic cigarettes on university property. Tobacco use is the leading cause of preventable death nationwide. Visit healthy.ucla.edu/pod/breathe_well to learn more.